Space Copenhagen paired deep blue velvet seating with mirrored accessories for this restaurant and cocktail bar in the Danish capital. The Danish firm hoped to steer away from their typical Nordic aesthetic and create a "dreamy" space lined with dramatic textures and colours for the venue LouLou. 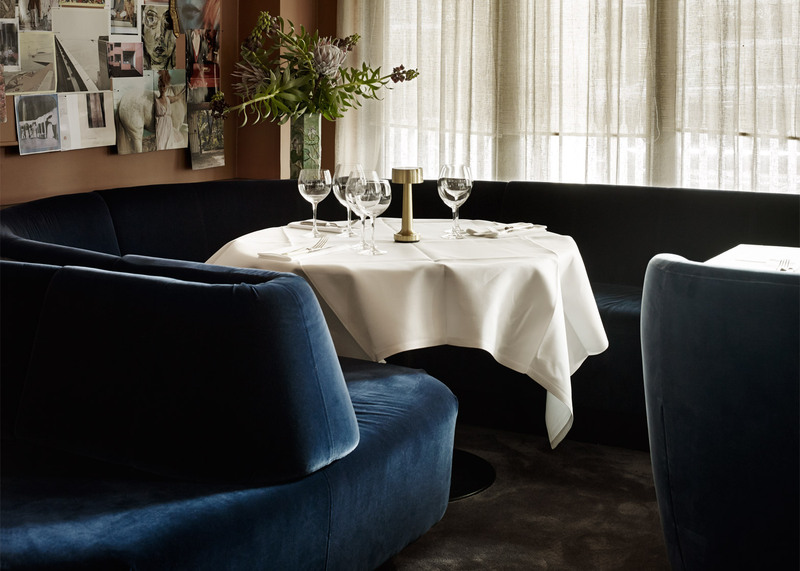 "LouLou's interior is a refreshing break, featuring deep blues, grey carpets and oak," said Space Copenhagen. "In contrast to a lot of our projects that carry a very Nordic touch, LouLou has a dreamier, more magical feel inspired by the neon-lit metropolitan night." Walls painted in soft warm tones contrast with deep navy blue velour sofas and the studio's Stay lounge chair produced by Gubi. Table settings are simple, with clean metallic lamps and white tablecloths. Decorations include elegant mirrored walls, collages of photographs and geometric and neon artworks by local artists.